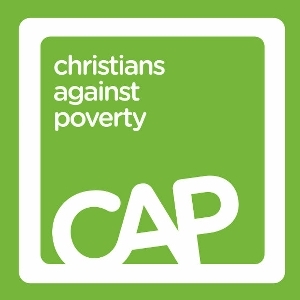 Christians Against Poverty (CAP) is a charity set up to support those struggling with debt issues and help them find realistic solutions to become debt-free. 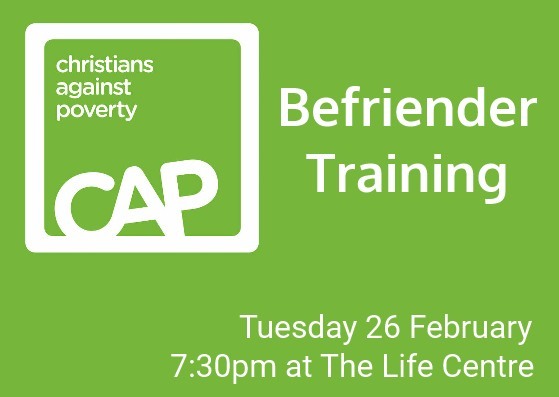 A CAP Befriender is a volunteer who comes alongside people as they work through this process, to offer friendship, support and encouragement. They will often attend appointments in a client’s home with a Debt Coach, who is the actual person who works on the paperwork, helps set a budget, and liaises between the client and CAP head office. The Befrienders don’t have to deal with any paperwork or get involved with the client’s finances. They maintain contact with a client once the initial process has been completed and are able to cheer them on as they seek to get their finances back on track. This could include going out for a coffee, taking someone a bunch of flowers, inviting them to join your five-a-side team, inviting them to church or Alpha, or going for a walk with them. If you think this is something you might like to do, there’s a training evening at the Life Centre on Tuesday 26th February at 7:30pm. I'd like to attend the upcoming training evening.